The name ‘Valley of the Sun’ is much older than most people imagine. I learned this as I listened to a strange and fascinating story. A story revealed to me by an old, wrinkled, white-haired apache woman one clear, chilly September evening as she huddled by my campfire. A story only she knows…and me, and now you! She explained how, millenniums ago the sun sent down an awesome, brilliant fireball to incinerate a band of giant invaders who threatened his children. She told me those Indians still survive today in huge caverns beneath the Valley floor. How they kidnap all who discover them, taking them away to their subterranean cities. I can’t swear this story is true, but I heard it from a dying woman, the guardian of her people’s legends. In telling this tale, I am making good my pledge to her that night, to keep the story alive after she was gone. Because I am deeply interested in Indian lore and traditions, I have spent many years studying and painting their ceremonial dances. I have become friends with many of them. It was through one such friendship with an Apache medicine man that I was invited to the very impressive ‘Changing Woman Ceremonial’ (Apache Crown Dance) for his daughter. Few white men are invited to these very personal, sacred ceremonies. I took it as a high compliment when I was asked to come. I recall the magic that drew around us even as we arrived at the ceremonial site in the mountains northeast of Phoenix. It was raining steadily and rivulets of water ran down the tracks in the dirt road ahead of us. “Looks like bad weather for the dance,” I observed to an old medicine man. He shrugged and replied, “No. I made the medicine to move the storm away until we’re through.” The rain soon turned to a light drizzle, then stopped. Not until the fourth day as we drove away from the meeting place did the rain clouds come back again. My daughter and I spent four days with the San Carlos Apaches and their guest from the Mescalero Apache tribe. I lent a hand in the cooking, corn grinding and wood gathering, as my daughter did. We soon melted into the crowd. The deep feeling of promise and beginnings swept us up, and though we couldn’t understand all the Apache word of the prayers, we prayed along with her people for the girl’s future happiness and well-being. Late the third evening, we returned to our camp from the colorful ceremonial dances and I put another log on the fire. Bright sparks jumped into the air and the flickering flames performed a ritual dance of their own. I sat almost hypnotized by the erratic movements of the fire, with the rhythmic beat of the drums in the distance. I heard someone approaching. There was a rustling of leaves, a snapping of twigs, the crunch of feet and the whisper of cloth brushing the undergrowth as two figures came toward us. As they entered the ring of light diffused by my fire, I recognized an elderly white-haired Apache woman I had ground corn for, and her granddaughter. Stiffly, the old woman, with the help of her granddaughter, settled down cross-legged near the warmth of the fire. The younger woman invited my daughter to go see something interesting in the main camp, leaving us alone in the serene beauty of the mountain night. The old grandmother leaned forward and said in a high-pitched voice, “You asked about stories. I will give you one because I like you and trust you. I will die very soon and I do not want my story to go to my grave with me.” She went on to explain that none of her young relatives seemed interested in the legends that had been passed down through generations of grandmothers. She asked me to pledge that I would help preserve the story she was about to tell me. I swore, and she slowly began the tale of the Tuar-tums, the little Indians who lived down in the ‘Big Valley’ (the Salt River Valley of the ‘Valley of the Sun’), and the Jian-du-pids, the giants who invaded their land, stole their water, ruined their fields, drove them underground and were finally seared into the earth by the Great Father, the Sun. She described the coming of enormous Indians, apparently as big as Paul Bunyon, who used a tree for a toothpick. They came dragging with them massive sleds containing all their wealth. 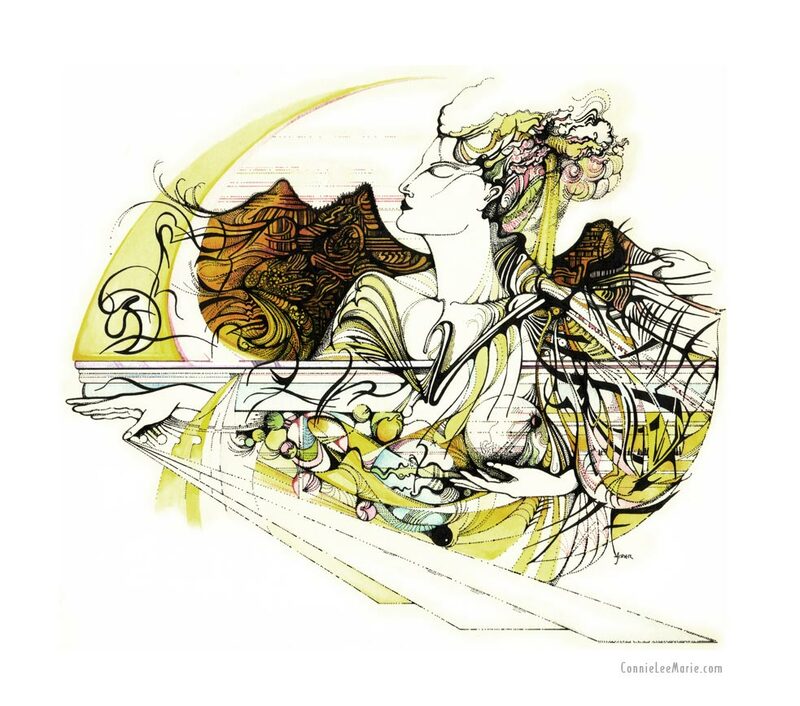 Their vast horde of gold weighed down a mountainous camel (she called it a Bay-ze-lea). They also had with them a huge reddish-brown hunting dog whose head stood as high as the knees of his masters. It swept on ahead, killing the Tuar-tuams and their animals and ruining their fields. The giants came from the northeast, headed for their old home in the south, led by Evilkin, a massive, hulking man who struck fear into the hearts of all who saw him. When they reached the Roosevelt Lake area, they decided they could go no further by land, that they must build a ship to carry them southwest to their home beyond the Gulf of Baja. But where could they find enough water in the parched desert to float such a tremendous ship as they required? The tiny Tuar-tums lived in the Big Valley using the water from the rivers to supply their needs for raising food. They lived a healthy, productive life until the Jian-du-pids came into the valley and diverted all the rivers, creeks and streams, destroying the dams and irrigation systems. The Jian-du-pids wanted all the water to flow down the Salt River so they could launch their ship. In trying to do this, they destroyed much of the civilization the Tuar-tums had built up. Many of the Tuar-tums were killed, their farms and homes ruined. For a time, the Jian-du-pids returned to the north to bring in more gold and supplies, but the Tuar-tums knew they would come again. To save their lives, the little people decided to build everything underground – their homes, their farms, even divert the rivers into the Undervalley. Since there were large honeycombed caverns already in existence, this was not an impossible task. 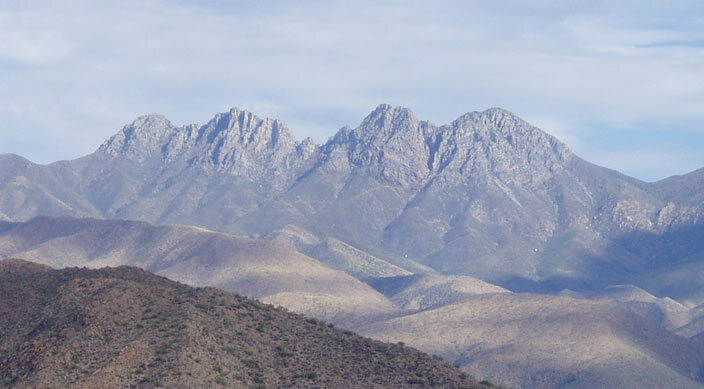 To the east, the Four Peaks each held a Tuar-tum sentry facing one of the four points of the compass. The lookouts signaled with polished copper shields to a central watchkeeper in the Valley to warn of the return of the enemy. When the Jian-du-pids returned with more supplies and gold, the bright copper shields flashed the warning. Bitter war, resulted, though of course the tiny Tuar-tums could do no more than tear down the new diversion dams at night, steal back their grain and torment the Jian-du-pids by piling thorn bushes and jumping cactus in their blankets. Retaliation followed as darkness follows dusk, and soon the Tuar-tums knew they must hide. They fled into the vast caverns which they had made ready beneath the Valley floor. They made their homes there, using stored food and supplies and grew their crops in tiny plots in out-of-the-way places on the surface. 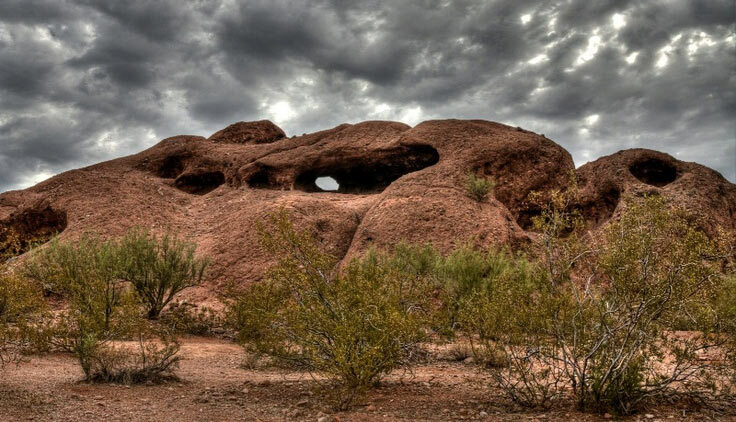 In what is now Papago Park, between Van Buren and McDowell Road, you will find ‘Hole in the Rock’. A window on the eastern face of the butte opens onto a wide downward slope under the western face. From the opening, westward, a huge tunnel sloped down to the safety of the catacombs of the Undervalley (below the city of Phoenix). At the very top is a small opening. The old woman explained that the central watchkeeper climbed a long wooden ladder from the main tunnel, which led into the caverns, and stood his watch looking out this vent. The ladder was made from small stripling juniper trees lashed together with leather thongs. What we see now as ‘Hole in the Rock’ was the main entrance to the Undervalley. One terrible dawn, after a particularly annoying Tuar-tum attack, in the blinding glare of the rising sun, the Jian-du-pids rushed the entrance to the Undervalley. Great feet rose and crashed down as the invaders stamped angrily on the tunnel roof and all around the area, collapsing many of the caverns and utterly destroying everything they could of the Undervalley and its people. Bay-ze-lea, their great camel, lay down a little way to the north, watching, and Dap-gong, their hunting dog, snapped and snarled fiercely at the wrecked entrance, peering through the tiny hole that led now only to a smashed slope of earth, debris, and dusty rubble. With that, trembling, Dar-lac retreated underground in utter despair. He did not see that the dawn this day grew more brilliant than ever before, that Father Sun flung out an orange ball of flame which almost touched the earth. It destroyed the giant ship in its cradle, leaving only molten rock to mark the place where the golden hoard of the Jian-du-pids lay buried. Dar-lac did not see the holocaust rush straight toward the rampaging, terrified invaders and sear them all to smoking skeletons – melting them down like butter, striking them lifeless and shapeless in an instant, their faces contorted in agony. The ‘the little finger of the Sun’, having flicked away the threat to his children, returned to the heavens. I looked up from the crackling, dancing flames of the campfire into the sad eyes of the old woman. “You see? The Anglos make a park for golf and picnics and cage up strange animals in a zoo. They name it all for the Papago tribe, right on the spot where all this happened. Do they not call the mountain to the north the camel’s back? Is there not still a hole in the rock where the door was? Are there not the grotesque melted faces of Evilkin and his henchmen in the stone of the buttes? Do you not see the dog still turning to snap at his tail in the searing flames? I said that I would go and look, and a week later, standing beside my van, I did see them. On the western face of the butte is a distorted but massive face, and across McDowell Road looking down on the National Guard vehicle park is another , and yet another she called Eye Socket Mountain. The camel is still there to the north without a doubt. Turning east, through the morning haze, I could surely see the ‘Four Lookouts’ (Four Peaks) in the distance north of the Superstition Mountains. The Superstition Mountain might, I suppose, look like a charred ship, and when I think of the hundreds who have searched the mountains’ innermost recesses for the fabled hoard of glittering gold, from Jacob Waltz on, I wonder. The old woman said they just haven’t dug deep enough to reach the ‘belly’, or what we would call the ‘hold’ of the giant ship. I have found no corroboration for the old woman’s story. All I can find are the molten faces in the stone…the camel’s back, the dog, the hole in the rock, Four Peaks, and the Superstitions. And I wonder! 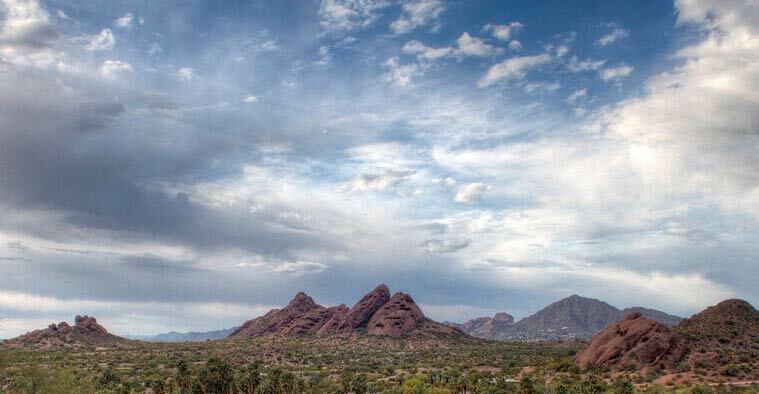 Why do so many climbers fall from Camelback Mountain and the Papago Buttes? 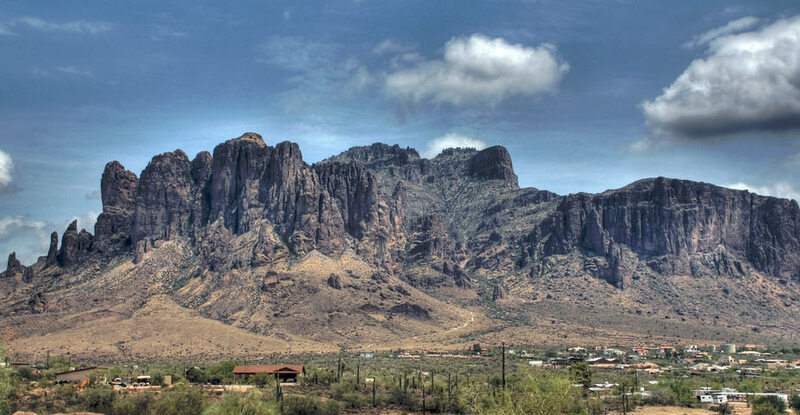 Why have so many people gone into the Superstition Mountains, never to be seen again? Is it forbidden soil, or sacred ground? Do the Tuar-tum medicine men cast an evil spell on those who trespass, causing the intruders to slip and fall? Or, are they pushed by the phantom-like Tuar-tums who scurry back down into their Undervalley? As she finished her story, we both sat quietly starting into the fire for several minutes without speaking; the she impatiently signaled for me to help her to her feet. As she quietly slipped away into the inky darkness, I shivered, but not entirely from the chill breeze which suddenly set the leaves on the trees dancing and murmuring above me. Day-ga-Khle-chee (Man with Red Whiskers) is the Indian name given to Clair Millett. He is well known to the Indians of the Southwest as an interested student of their lore. His paintings capture the mystic glow of firelight behind ceremonial dancers in full costume, and while he gathers material for his art, he gathers stories too. This is one of them. The Apache story-teller has since passed away and so has Clair; but, as she requested, the story has not followed her. Note from Connie: I met Clair Artimus Millett while swimming at Havasupai Falls in the Grand Canyon in the late 1970s. We became friends and Claire gave me a copy of this story asking me to help preserve it. 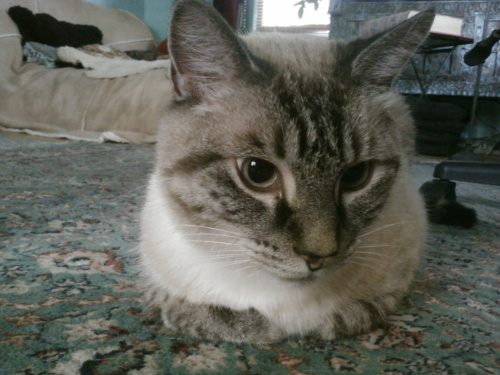 Claire passed away in August of 2008 and as he requested, the story did not follow him!